To make dough, combine flour and salt in a bowl. Cube cold butter and cut it into the flour until it resembles small balls. Then add the egg and stir in enough cold water to bring the dough together into a bowl. It should resemble pie crust, but be a bit easier to work with. Once the dough is in a tight ball, wrap it in plastic and let it sit for 30 minutes. To make the filling, soak the larger dried New Mexico chilis (you could also use ancho chilis) in very hot water for 10 minutes. Then remove the seeds and dice small. Also dice the chipotle peppers and crumble up the Arbol peppers. In medium pan, add a tablespoon of olive oil and then all the ground beef. Once the ground beef is almost browned, add the onions, chilis, and a few Tablespoons of water. Season with salt and pepper. Add grated cheese straight to beef. The cheese will melt slightly and make filling the empanadas easier. Roll dough out until it's pretty thin, about 1/8 inch. Cut out rounds using cookie cutters or use a bowl as a guide if you're making larger ones. Add filling to one half of empanada circle, leaving about 1/2 inch around the ends. Brush egg wash around the edge of the empanada and then fold it over. Press out as much air as you can and seal the empanada by rolling over the edges. Cut a few slits in each empanada and brush them with egg wash to make sure they turn golden brown while baking. Bake at 350°F for 25-30 minutes until empanadas are a golden brown. The only thing I can think of that's close is a pastry stuffed full of spicy cheesy-meaty goodness. So that's what we're working on today. While these may look like a bit of work, the dough is actually a lot easier to work with than say, pie dough, and the results will blow away your guests. Or you could just hoard them all for yourself, of course. Or you could do what I did: double the recipe. Share some, hoard some! If you've ever made pie crust from scratch, this dough will be a lot easier for you. It's basically pie crust plus an egg which makes it much more flexible, but still flaky and delicious. Start by mixing your flour and salt together and then cut in your cold butter until the butter is in small balls (above). Then add the egg and a few tablespoons of ice cold water and mix until the dough forms a tight ball. Wrap this in plastic wrap and let it sit for 30 minutes while you work on the filling. I call these three chili empanadas because they have…three different kinds of chilis in them! How original am I?! I used dried New Mexico peppers, dried arbol peppers, and chipotle peppers in Adobo sauce. You should be able to find most of these things. You can substitute almost any peppers you want though (anchos for the New Mexicos for example). This mix should give you a good amount of heat with a wide range of chili flavor. For the dried New Mexico (or ancho) peppers, soak them in very hot water for about 10 minutes. For all the peppers, remove the seeds (or leave them in for more heat) and dice them up. Once you're peppers are ready, the filling is pretty straightforward. Cook the beef with a tablespoon of oil until it's browned. Then add onions and chili peppers and a few tablespoons of water. Let it simmer for a few minutes on low until the flavors combine. Adjust with salt and pepper and feel free to add more of the peppers if you like it spicier. Making the empanadas is actually pretty straightforward. Start by rolling out your dough until it's fairly thin, maybe 1/8 to 1/4 inch. Then use a bowl or cookie cutters to cut out the rounds. Feel free to use lots of flour during this so the dough doesn't stick to your counter. Then take each round and roll it out individually until it's even thinner. Add filling to one half of the round. Leave about a 1/2 inch of room around the filling so you can seal the empanada. Take your egg wash and brush around the edges of the empanada and then fold over the dough to encase the filling. Try to push out as much air as you can and get a tight seal on it. I like to roll my edges up to seal the empanada but you could also use a fork to seal them. When you have them all made, cut a few slits in the empanadas, brush them all with egg wash and, if you want, sprinkle some red pepper flakes on top. As I mentioned, I made some mini versions of these to take to a party. Mini ones aren't any harder than large ones. They just require a bit more time. Stuff them and fold them just like you would the big guys! If you're doing larger ones, bake them at 350 degrees for about 25 or 30 minutes until they are golden brown. Smaller ones will take maybe 20 minutes to finish. The end result is a nice flaky crust with a cheesy and spicy filling. Basically the best thing in the world. 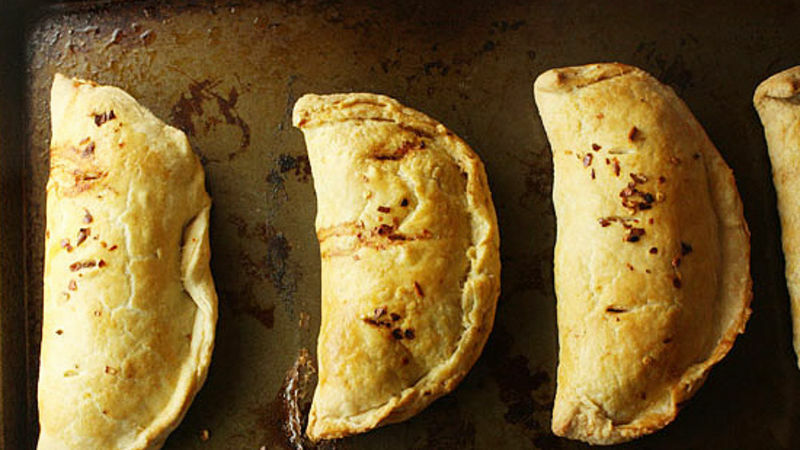 If you've ever made pie crust from scratch, you can make these. In fact, these are a stepping stone to homemade pie crust because the dough is a lot easier to work with. Nick wishes he could mail all of you an empanada. He's still trying to figure out how to mail things through the Internet on his blog, Macheesmo and on his Tablespoon profile.